"Put some Porter's on it," our mothers used to say. After more than 90 years, this soothing first-aid salve is still providing healing comfort to bruises, rough and cracked skin, insect bites, sunburn and local irritations. 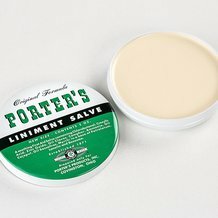 The drawing quality of Porter's Liniment Salve works particularly well on slivers of metal, wood, or glass beneath the surface of the skin. A soothing first aid salve: Aid to prevent infection in minor cuts, burns and abrasions; provide temporary relief of discomfort due to minor burns, sunburn, chapped skin, non-poisonous insect bites and minor itching. CAUTION: Do not apply to large areas of the body. In case of deep or puncture wounds or serious burns, consult physician; if redness, irritation, swelling or pain persists or increases, or if infection occurs discontinue use and consult physician. Directions: Apply salve freely after thoroughly cleansing and drying affected parts with warm water. KEEP THIS AND ALL DRUGS OUT OF THE REACH OF CHILDREN. In case of accidental ingestion, seek professional assistance or contact a poison control center. My grandma used it for everything when I was little. I was so happy when I found it again about 10 years ago, my kids love it also and use it on everything from chapped lips to splints. I happen to like the smell because it reminds me of my Grammy. I've gotten all the ladies at work using it now! We have used this for over 60 years. It's the best for almost everything. Bee stings, cuts, scrapes, eczema, rashes, and anything else you can think of. I'm 4th generation and I'm teaching my kids about it. I hope they don't stop making it. Lastly, you need such a small amount that 1 tin lasts a really really long time. Depending on use, we go through 1 tin every 2-3 years. I grew up with this salve and love it to pieces. My kids and grandkids also love it. When they get hurt they come running asking for the stinky salve. That is what we called it growing up and my kids also call it that. I oldest grandson told me the other day that he wished they made a candle that smelled like that he would burn it all the time. We love this stuff,we learned about it from a 70 yr.old fellow.He told us to ask the pharmacy for it.The pharmacy was shocked we even knew of it.We have used it on boils,soars,sunburns,and scares.I highly recommended this to friends and family. No matter the cut or scrape, it always heals it quickly. My whole family swears by it and it wa drew only thing we used as a kid. Totally stops the hurting faster than other products! This stuff... is ahhhmazing. My mother has had us use this on scrapes, cuts, and even getting splinters out as kids. She hasn't been able to find it anywhere (locally) and just started searching for it and so glad I came upon it because she LOVES this stuff. It works so well and when we had splinters as kids, put this stuff on and it would come out the next day/easier to get the splinter out. I plan on buying a ton of this stuff now I know where to get it since it's not sold locally. My family has sworn by this product my whole life and even before that. My grandmother and my parents would put this on us for nearly everything. It always worked great. I know that the family has used it for at least 65 years. We always called it stinky salve. We have used it for years in our family for any type of scrape or cut, even to heal diabetic ulcers. The absolute best healing agent I have ever seen. I wish doctors would have a little more faith in some of these old remedies. I have a can of porters salve pasted down in my family from my great grandmother. No product could be any better or work as good. I will be sure to pass it down as well! 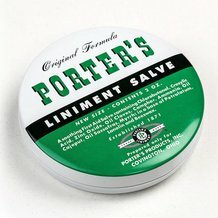 My family has used Porter's Salve for at least 60 years (my age) and probably longer for all skin irritations. I made a believer out of my boyfriend when he had a cut on his leg that was still stinging after a day. I put in on and over night the sting was gone !!! Great for stings, burns, cuts, etc. with a band aid to keep it on. My children swear by it also. My grandma used this stuff on me for everything from a cut, to a burn, to chapped skin, diaper rash and bug bites. As an adult, I swear by the stuff and will use it over neosporin, aloe, lotion etc. It just works. Have a stress induced plantar (foot) dermatitis for 10 years and medicine had no value. Myself a nurse I went from product to product until quite accidentally finding Porters's. I clean and pat dry the skin, apply this and put on fresh socks then instant relief of the irritation, itch, dryness. It is a wonderful product!!! In my late 70's, my family has used this salve all my life for everything!! I have passed on to next generations and give as Christmas presents. Anytime, anybody is hurt, first comment is get grandma's medicine, that'll fix it!. I even send to my husband's family in Mexico and they now request it as well! The grandkids love it cause it heals without any burning, the teens use it on blemishes on their face, any nail infection, ANYTHING - this works wonders!!!! My dad had a nasty spider bite that was having a hard time healing, he finely put porter's salve on it and it healed right up. Have used Porter's for years. Originally made in the town I grew up in. After all these years, still worth keeping. My parents used this for years, for cuts, insect bites, infections, everything, now I've used it for years, it's great stuff. My husband has scars that attract mosquitoes and now deer ticks. Both bites lead to oozing wounds that are difficult to heal. Porter's Liniment is the first salve he's tried that showed amazing results. Within 2 days the area was drying and the infection gone! Excellent product for getting insullation (the pink kind and blown in type) and glass out of hands and feet(my poor toes). I had gloves on but it must have fell thru the wrist part. Its been 6 years since I could play my guitar. Soon I will be playing again. Awesome product. Skin doctors gave up on me because they did not know what it was causing red sores. Now I am unemployed and have no health insurance. But I don't need it with Porters. I use this along with QURET another great product! have used porters for years. couldn't find it in az.